Sixty-five million years ago, the comet that will kill the dinosaurs enters Earth’s atmosphere. Crashing into the planet, the “comet” turns out to be a prison pod containing the universe’s most heinous criminal: The fungus creature called Ooo-Zah. Ooo-Zah had tried to foil the Big Bang at the dawn of creation and was imprisoned for untold eons by the saurian aliens called the Newts. Now with a seething hatred toward all saurian life, Ooo-Zah possesses rocks to create a new body and then single-handedly kills every dinosaur. However, before he can move onto the mammalian life, an earthquake buries him deep below the ground, sealing him away from his power source: Light. Millions of years later, a cheese factory is built over Ooo-Zah’s tomb. A single spore of his fungus manages to escape into the factory, where it mixes with a vat of cheese and is sealed into a tub. That cheese is then taken to Gavin’s Pizza Restaurant in New York City. Down in the lair, Leo, Raph and Mikey are enjoying some rough-housing and weapons practice while Splinter is out at the Jackie Chan movie marathon. Annoyed by their antics, Donatello confiscates all their weapons and locks them in the closet. Before his brothers can protest, April arrives with a freshly prepared pizza… from Gavin’s. The hungry Turtles open up the box and the light reawakens Ooo-Zah. The entity comes to life in the form of mozzarella and attacks with its many sticky tentacles, vowing to eliminate all “saurians”. 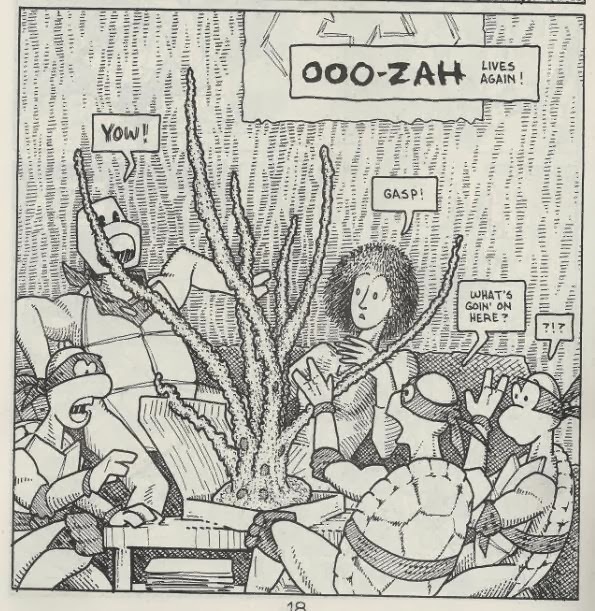 The Turtles and April attempt to fight back, but Ooo-Zah continues to grow and grow. Worse yet, they have no weapons because Donatello locked them all in the closet. Things look bad until Don notices that Ooo-Zah is hovering near the lamp. He figures that Ooo-Zah needs light in order to stay active and smashes the bulb with a throwing star. Ooo-Zah weakens in the darkness, giving the Turtles and opening to retrieve their swords from the closet. Being ninja, they’re unaffected by the darkness and easily cut Ooo-Zah’s mozzarella body to ribbons. April asks how they’re going to dispose of all the cheese and Donatello suggests they lock it in an old steamer trunk and bury it in the deepest, darkest sewer tunnel they can find. On their way to dispose of Ooo-Zah, Raph suggests they get a REAL pizza… just from a different restaurant. *This is the second installment in the TMNT Special series. It was preceded by TMNT Special: “Times” Pipeline and will be followed by TMNT Special: The Maltese Turtle. 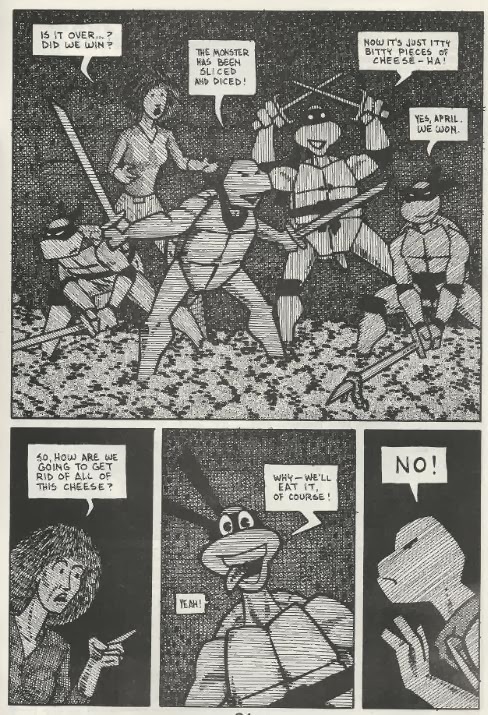 *Prior to this special, Howarth had contributed to the TMNT “guest era”, providing TMNT (Vol. 1) #41. Hey, it's Matt Howarth! He didn’t seem to contribute quite as much as the other participants during the “guest era”, which is a shame, as his style felt like a real change of pace amongst the other “silly” guest stories. 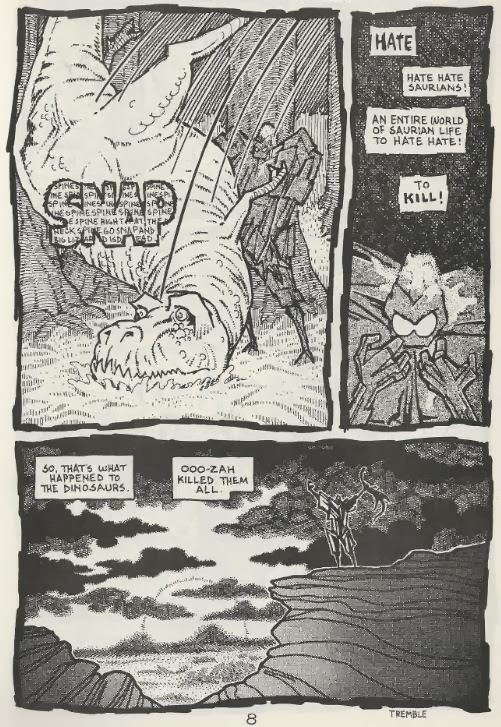 His Turtles are lanky and simplified, but the pared down aesthetic looked unique compared to everyone else, who had a tendency to “over draw” their comics. And don’t let the word “simplified” fool you into thinking these pages look like a rush job. Howarth uses a lot of lines in the background for emphasis and utilizes cross-hatching over block inking, so I imagine these pages took a while to pencil and even longer to ink. It's a sort of "faux woodcut" style that's really unique; I like it. The story is goofy, the conflict is simple and the resolution is obvious. “The Haunted Pizza” is a very brisk adventure even at 32 pages and you’ll be through it in a handful of minutes. In that regard it can be easy to forget about and the narrative doesn’t offer any of the introspection that Howarth worked into his previous tale, “Turtle Dreams”. On the bright side, those legitimately annoying Post Bros. don’t make any cameo appearances. So there’s that. One aspect of this issue that can be a little confusing is that no Turtle has a signature weapon. Rather, they all trade and swap weapons throughout the tale. At the start, Leo uses a staff, Raph uses a sword and both Don and Mikey use nunchakus. Then, at the end, everyone uses a sword except Raph, who uses his sais. Or I think that was supposed to be Raph. And therein lies the problem. Without their signature weapons, you can’t tell which Turtle is which unless they’re addressed by name. This IS a black and white comic, after all. 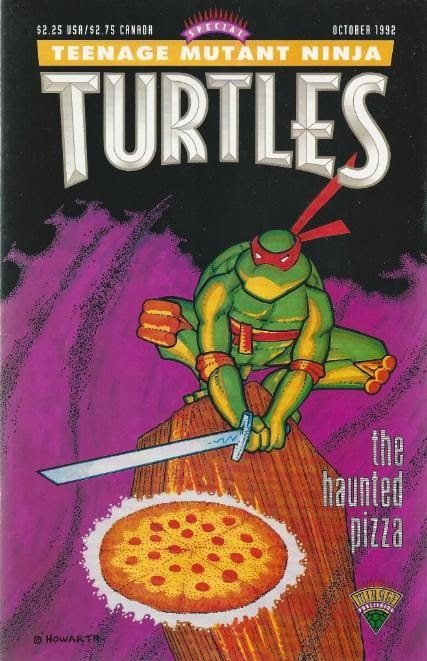 “The Haunted Pizza” isn’t an essential TMNT tale by any means and it’s probably something to save for the very last, if you’re out to collect all the Mirage comics. But it isn’t what I’d call a bad comic, either; there’s nothing obnoxious or truly incompetent about it. It’s just very forgettable. I've always liked this story. It was fun, something I can't always say about every Mirage book. It sure can be hard to tell the turtles apart when they mix up weapons, however. And I certainly agree that this plot would have fit right in with the classic cartoon show. Seems like Howarth was even trying to cater to the cartoon fans by putting the pizza right on the cover. Hey man! Nice review. Is this comic collected anywhere else? I don't think it is... but I know Mark would know! Thanks. Great site. Absolutely killer!